John McKenzie with a Mickey unit. The Greensboro (NC) News & Record reads The Mickey Spirit! 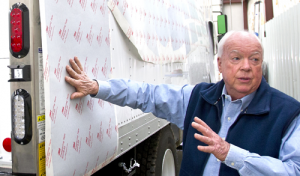 Business Reporter Kelly Poe saw the article in the January 2014 issue about McKenzie Industries, Mickey’s exclusive decal installer based in Jamestown, NC, and interviewed owner John McKenzie for a story of her own. The article ran on the front page of the February 27, 2014 edition of The News & Record under the banner headline: High Point decal company traces roots to NASCAR advertising Decal Dynasty. The entire News & Record article, along with the letter from Dean Sink is available on the Mickey web site. Click HERE.